18 Nov 1534 Mesopotamia part of the Ottoman Empire. 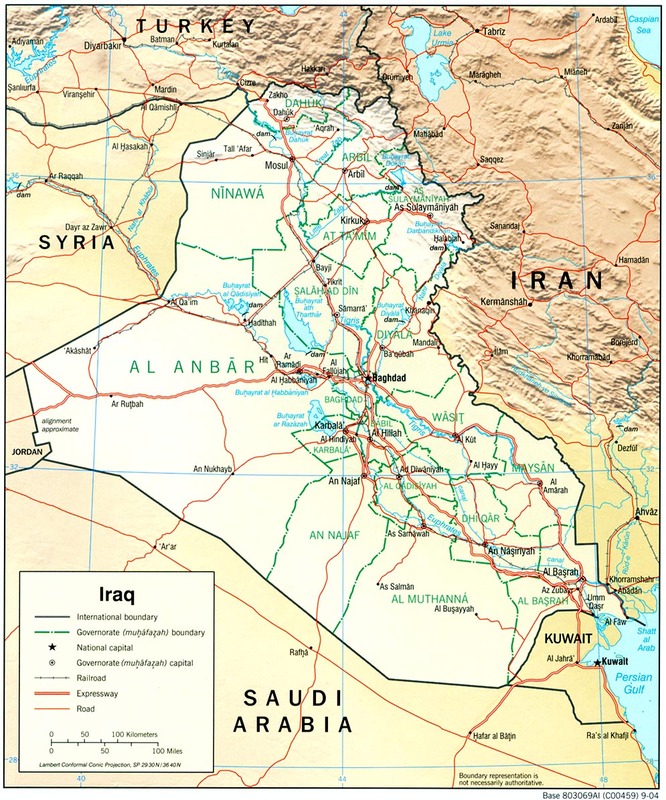 1535 - 1864 Baghdad Eyalet established. 1538 - 1862 Basra Eyalet established. 1623 - 24 Dec 1638 Persian occupation. 1697 - 1701 Persian occupation of Basra. Baghdad and Basra under nominal Ottoman suzerainty. 1776 - 1779 Persian occupation of Basra. Jun 1831 Direct Ottoman rule restored. 1869 Ottoman Vilayet of Baghdad established. 1916; Baghdad occupied on 30 Oct 1918). 10 Jan 1919 British civil administration (Mesopotamia). and Basra a League of Nations Mandate under U.K.). 2 Dec 1922 - 26 Dec 1981 Iraqi-Saudi Arabian neutral zone in southern area. 3 Oct 1932 Full independence. 2 May 1941 - 26 Oct 1947 British occupation. 14 Feb 1958 - 2 Aug 1958 Federation with Jordan (Arab Union). 8 Aug 1990 - 27 Feb 1991 Annexation of Kuwait (as 19th province of Iraq). 11 Apr in Mosul; 13 Apr in Kut; 14 Apr Tikrit). 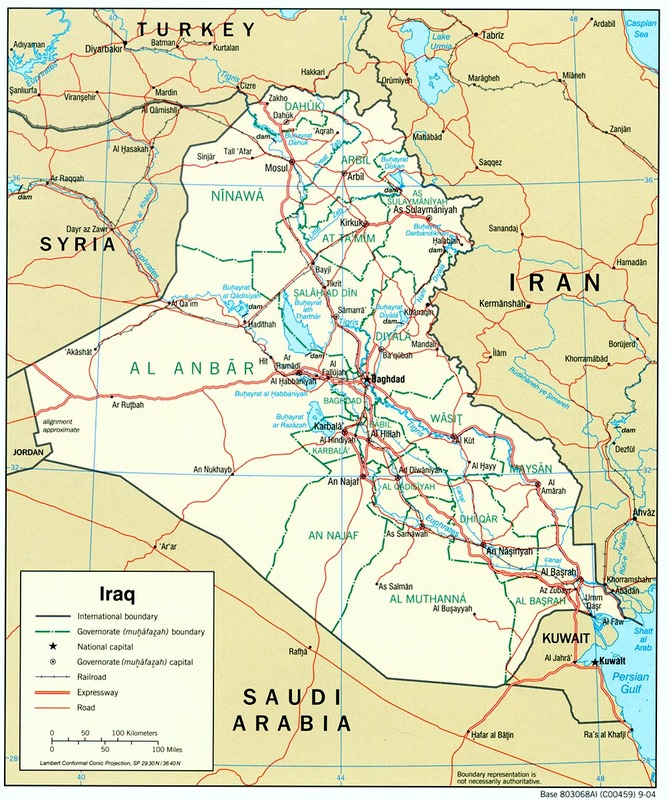 9 Apr 2003 Iraq (also in official use Republic of Iraq). 28 Jun 2004 Sovereignty restored (State of Iraq). ¹The full style of the ruler: Malik al-`Iraq ("King of Iraq"). (b. 1933?) NDP; Jalal Talabani (Kurd, Sunni)(s.a.) PUK; Massoud Mustafa Barzani (Kurd, Sunni)(s.a.) PDK; Iyad Allawi (Shi'a)(s.a.) INA; Ahmed Shya'a al-Barak (Shi'a) Non-party; Adnan Muzahim Pachachi (Sunni)(s.a.) IID; `Aqila al-Hashimi (f)(Shi'a) (b. 1953 - d. 2003) Non-party (to 25 Sep 2003); Sayyida Raja Habib al-Khuzaai (f)(Shi'a) Non-party; Hamid Majid Moussa al-Bayyati (Shi'a)(b. 1942) ICP; Sayyid Muhammad Bahr al-Uloum (Shi'a)(s.a.) Non-party; Ghazi Mashal Ajil al-Yawer (Sunni)(s.a.) Non-party; Mohsen Abdul Hamid (Sunni)(s.a.) IIP; Samir Shakir Mahmoud al-Sumaydi (Sunni)(b. 1944) Non-party (to Apr 2004); Mahmud Ali Uthman (Kurd, Sunni) (b. 1938) Non-party; Salah al-Dim Muhammad Baha al-Din (Kurd, Sunni)(b. 1950) KIU; Yunadim Yusuf Kana (Assyrian Christian) (b. 1951) ADM; Muwaffaq al-Rubaie (Shi'a) (b. 1947) Non-party (to Apr 2004); Dara Nur al-Din (Kurd, Sunni)(b. 1953) Non-party; Sondul Chapouk (f) (Turkoman) (b. 1968?) IWO; Wael Abdul Latif (Shi'a)(b. 1950) Non-party; Abdul Karim Mahmoud al-Mohammedawi (Shi'a) Hez; Ezzedine Salim (Shi'a)(s.a.) IDM (to 17 May 2004); Salama al-Khafaji (f)(b. 1958)(Shi'a) Non-party (from Dec 2003). Territorial Disputes: Approximately two million Iraqis have fled the conflict in Iraq, with the majority taking refuge in Syria and Jordan, and lesser numbers to Egypt, Lebanon, Iran, and Turkey; Iraq's lack of a maritime boundary with Iran prompts jurisdiction disputes beyond the mouth of the Shatt al-Arab in the Persian Gulf; Turkey has expressed concern over the autonomous status of Kurds in Iraq. 1508 - 1534 Persian occupation of Mosul. 18 Nov 1534 Part of the Ottoman Empire. 1535 - 1864 Mosul Eyalet established. 1623 - 1638 Persian occupation of Mosul. 1649 - 1859 Kurdish Baban Emirate near Sulaimaniya. 1726 - 1834 Post of governor held almost exclusively by the Jalili dynasty. 1870 Last of the Kurdish principalities dissolved. 1878 Mosul Vilayet established and separated from Baghdad. 3 Nov 1918 Mosul occupied by Britain. 23 May 1919 - 17 Jun 1919 Independent Kurdish state proclaimed in rebellion. 24 Apr 1920 Mosul declared a part of the mandated territory of Iraq. 10 Aug 1920 Ottomans cede vilayet of Mosul to Allies by Treaty of Sèvres. of the British High Commissioner. 1 Feb 1922 - 23 Jul 1923 Partial Turkish occupation; Mosul claimed by Turkey. Sep 1922 - Jul 1924 Independence of Kurdistan (from 18 Nov 1922 Kingdom) proclaimed. 13 Jan 1926 Turkey recognizes Iraqi sovereignty over Mosul. 1930 - 16 May 1931 Last revolt of Sheikh Mahmoud Barzani (b. 1878 - d. 1956). 1931 - 1937 Rebellion led by Sheikh Ahmed Barazani (b. 1896 - d. 1969). 1943 - 1945 Rebellion led by Mullah Mustafa Barzani (b. 1903 - d. 1979). (governorates of Erbil, Dahuk and As Sulaymaniyah). becomes an Iraqi government minister. 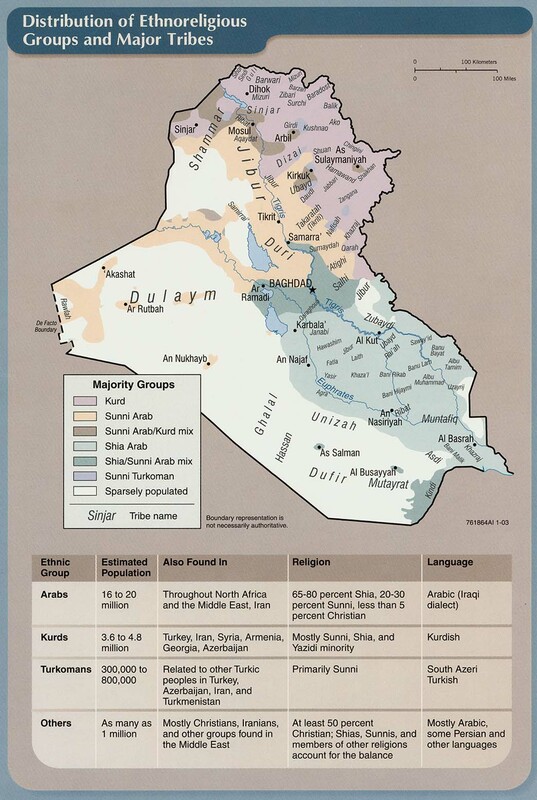 Oct 1991 Iraqi government withdraws military, de facto autonomy. 10 Mar 1992 Most of Iraqi Kurdistan occupied by Kurdish forces. 1 Apr 1992 Iraqi government re-occupies Kirkuk. 4 Jul 1992 Kurdistan Regional Government formed (not recognized by Iraq). Patriotic Union of Kurdistan, which moves to Sulaymaniyah. 10-11 Apr 2003 Kurdish forces briefly occupy Kirkuk and Mosul. Dohuk, as-Sulaymaniyah, and from 2014 Halabja, claiming Kirkuk). 21 Jan 2006 PUK and KDP sign the regional government unification agreement. 12 Jun 2014 - 16 Oct 2017 Kurdish forces occupy Kirkuk.